Whereupon Rosario lets out a polite chuckle and quietly returns to my 90-minute Healing Massage treatment. 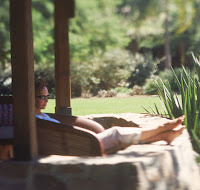 A true professional, Rosario, like many other therapists on the Spa & Wellness team at Rancho La Puerto, has been at “The Ranch” longer than many other destination spas have been in business. Over the course of 60 years, Rancho La Puerta, just south of the U.S. border in Baja California, has evolved from a rustic ranch to a sophisticated destination spa resort. It’s a palette of wellness awaiting your arrival, with creative organic cuisine, eye-opening nature at every turn, and hundreds of activities and programs to keep you busy -- or not, the choice is up to you. In addition to set programs, the Ranch offers specialty weeks set out almost a year in advance. During my visit, Phyllis Pilgrim, the Ranch’s fitness director, and Irene Borger, a popular writing coach, held a daily class entitled Inspiration: Yoga and Writers’ Workshop. Activities carry on into the evening with movies, lectures on the changing political landscape of Mexico, and a not-to-be-missed bingo night. The pre-breakfast morning hikes are an invigorating start to each day. Lasting 45 to 60 minutes, they offer stunning views of mystical Mount Kuchumaa and the rugged Baja California topography. Guests are free to choose from a variety of hikes led by experienced guides. Not to be missed is a hike to the Ranch’s organic farm and home to the new cooking school La Cocina Que Canta -- “The Kitchen That Sings.” La Cocina will soon be the hub of any food lover’s vacation dreams, featuring hands-on cooking classes with just-harvested organic ingredients. With over 150 activities and classes available, guests may venture to try new activities such as Feldenkrais or Pilates or settle into old favorites. 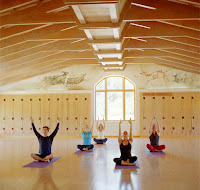 Although the majority of guests are women, more and more men are visiting, and the Ranch also offers custom programs, including circuit training, yoga and stretching classes. (The yoga and stretch classes were so rewarding, they inspired me to continue the practice at home.) The well-appointed Men’s Fitness Center, with sauna, steam room and private outdoor Jacuzzi, was a welcome sanctuary, and conveniently located adjacent to the computer room --– for those of us who couldn’t leave home without it.